I think that scallops add an adorable and feminine touch to any piece of clothing. Thankfully they are super popular right now and very on trend. You can rock them on just about anything from shoes, to dresses, to shorts, and more! I've rounded up some of my favorites for you and any of these would make a darling addition to your wardrobe. My number one favorite is this t-shirt because it's the perfect wardrobe staple and is only $25! I'm seriously thinking of buying it for myself. I also really love this chambray dress, it has a pretty and unique silhouette, it's different (in a very good way) from any scalloped piece I've seen. Last, but not least, I am dying over these sandals and think I might have to buy them too. What can I say?! I'm crazy about scallops! What do you think about scallops for summer? Come to think of it... I don't think I own anything scallop. Love the trend though! I love the scalloped look! I need some more in my closet! I LOVE scallops! I would die to have that scalloped denim dress in my closet :) Super cute roundup! I love scallops!! Obsessing over that orange romper. So cute!! I have been loving scallops lately!! SO pretty and that romper is SO cute!! So much scalloped love! It's so swet and feminine, the perfect summer style! Look #7 is my favorite. Cute finds. I love the scallop trend! That orange romper is gorgeous! How cute is that orange romper omg! I'm loving the scallop trend! What awesome picks!!! I grew an obsession with scallops last summer. 6 and 7 are definitely my favs here. 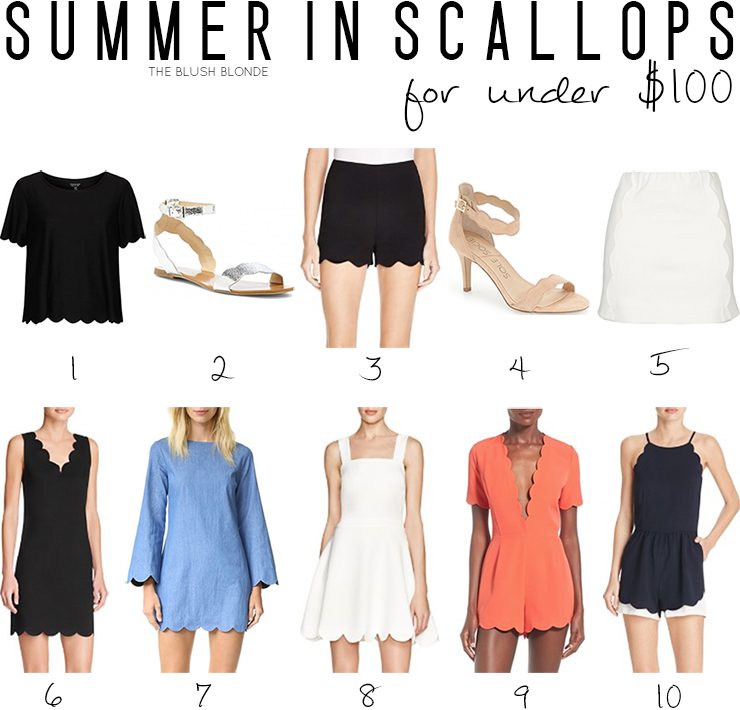 LOVE the scallop trend, especially #6! I love that orange romper! The scallop detailing is always a nice way to chic up a simple outfit! So cute!. Especially loving adorable skirt So unique! Scallop detailing is one of my fav summer trends! Loving all the scalloped options this summer!